Top 10 Rarest Gems of All Time are getting hot and trending during 2014-2015 Gems are one of nature’s ways of saying, “look how beautiful I can be”, and people know it, too. For thousands of years humans have been adorning themselves with gems and jewels to stand out and wow an audience. Be it necklaces, brooches, pendants, or bracelets, precious and rare gems have long since become one of the favored ways to express just how much wealth one has. Here are the ten rarest gems on earth. USD $2000/CaratJeremejevite-1Pronounced ye-REM-ay-ev-ite, this is a colorless, sky blue or pale yellow stone, the highest quality of which comes from Namibia. In nature it occurs in small obelisk-shaped crystals and has in the past been mistaken for aquamarine. It was named after Russian mineralogist Pavel Jeremejev who discovered the mineral in 1883. As of early 2005, a clean, 2.93-carat faceted gem was selling on the Internet for $2000.00 per carat. USD $2,355/CaratFrontnew1Australia is the classical Opal country and today is the worldwide most important supplier of Fine Opals. Almost 95 per cent of all Opals come from Australian mines. The remaining five per cent are mined in Mexico, and in Brazil’s north, also in the US states of Idaho and Nevada, but recently the stones have also been found in Ethiopia and in the West African country of Mali. Black Opal or Opal with a dark gray body shows the most brilliant play of colors imaginable. USD $10,000.00/CaratRed Beryl EmeraldRed beryl is found primarily in the Thomas Range and the Wah Wah Mountains of Utah, and has also been reportedly found in a location in Mexico (possibly near San Luis Potosi one of the very few places beryl is also found on rhyolite). Where it is found in Utah it occurs on rhyolite, where it crystallized under low pressure and high temperature, along fractures or cavities and porous areas of volcanic rhyolitic magma. Very few cut specimens exist. USD $35,000/CaratMusgraviteMusgravite is one of the newest and most rare gemstones in the world. Musgravite is a silicate mineral whose main ingredients are beryllium (Be), magnesium (Mg) and aluminum (Al). It was named ‘musgravite’ after the area Musgrave in Australia from where the material was first found. The musgravite was later found also in Greenland and Madagascar, but neither of them produces gem quality material. Two pieces of faceted gem-quality musgravite from Sri Lanka were reported first in 1993. Keep in mind, this is the LEAST priceless of the ten. USD $50,000/.5 CaratGrandidierite-1This is a bluish green mineral found primarily in Madagascar. The first and so far only clean faceted specimen, from Sri Lanka, was originally mistaken for a serendibite and subsequently purchased in May 2000 by Prof. Gübelin from Murray Burford. The gem shown above weighs 0.29 carats. Grandidierite is trichroic, transmitting blue, green and white light. The mineral is named after French explorer and natural historian Alfred Grandidier, who among other things unearthed bones from the extinct half-ton elephant bird in Ambolisatra, Madagascar. USD $50-60,000/CaratPainite Faceted4This gem was once believed to be the rarest mineral on earth, is today still considered very rare. British mineralogist 1950s first discovered it in Myanmar. When it was confirmed as a new mineral species, it was named after him: Arthur C.D. Pain. For many years, only three small painite crystals were known to exist. Before 2005 there were less than 25 known crystals found, though more material has been unearthed recently in Myanmar. 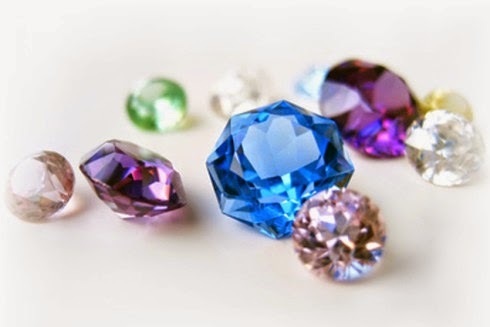 USD $1.5 Million/CaratBluegarnetGarnets species are found in many colors including red, orange, yellow, green, blue, purple, brown, black, pink and colorless. The rarest of these is the blue garnet, discovered in the late 1990s in Bekily, Madagascar. It is also found in parts of the United States, Russia and Turkey. It changes color from blue-green in the daylight to purple in incandescent light, as a result of the relatively high amounts of vanadium. The most expensive, a 4.2 carat gem sold in 2003 for $6.8 Million. USD $1.8-2 Million/CaratSerendibite-1This gem is a cyan colored stone that comes from Sri Lanka. It boasts an unusually complex formula consisting of calcium, magnesium, aluminum, silicon, boron and oxygen. So far there exist only three faceted (cut) specimens of 0.35 carats, 0.55 carats and 0.56 carats. The first two were discovered by rare stone specialist D. P. Gunasekera and purchased by the late Prof. E. J. Gübelin of Switzerland. The smallest was sold for about $14,300.00 per carat. USD $2-2.5 Million/CaratReddiamondOnly a very few red diamonds are ever found, and few people have only seen even one treated red diamond. The gem is described as a purplish red, so it is not a pure red, crimson, vermilion, or scarlet. Nevertheless for its size it is one of the most expensive diamonds ever. The Argyle Mine in Australia produces a small number of red diamonds. The largest and finest of these are auctioned every year or two, and sell for millions of dollars. USD $3 + Million/CaratJadeiteUntil recent years jadeite has been something of a mystery mineral, but we now know of primary sources in Guatemala as well as several California occurrences of white or grayish jadeite. Boulders in which a few small freestanding crystals have been seen occur in San Benito Co., California, with additional finds in Clear Creek, between New Idria and Hernandez. All Mexican jadeite is in artifacts, from unknown sources. The record price for a single piece of jadeite jewelry was set at the November 1997 Christie’s Hong Kong sale: Lot 1843, the “Doubly Fortunate” necklace of 27 approximately .5 mm jadeite beads sold for US$9.3 million.